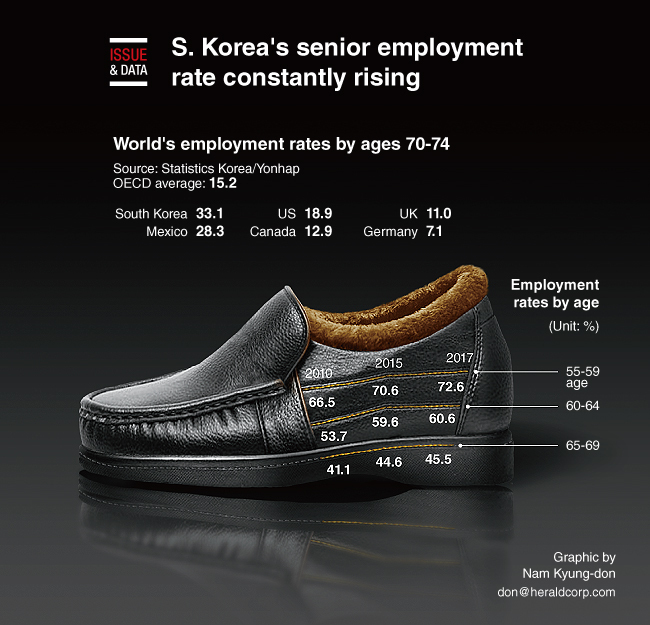 According to the data compiled by Statistics Korea, the number of people aged 65 years or older reached 7.38 million in 2018, accounting for 14.3 percent of the country's total population. The employment rate for those aged between 55 and 59 was 72.6 percent in 2017, compared to 70.6 percent in 2015 and 66.5 percent in 2010. The comparable figure for those aged between 60 and 64 stood at 60.6 percent in 2017, rising from 59.6 percent in 2015 and 53.7 percent in 2010, the latest findings showed. And 45.5 percent of those aged between 65 and 69 worked in 2017, compared to employment rates of 44.6 percent and 41.1 percent, in 2015 and 2010, respectively.